A surfeit of cathedrals, churches, chapels, temples in Ghana: Who needs a national cathedral? With no compelling nationalistic or even scriptural argument to justify this personal project, every indication is that it is still going to be imposed on Ghanaians. Can you imagine a British Prime Minister, a French President, a German Chancellor, a US President, a Canadian Prime Minister, a Japanese Prime Minister, etc, coming up with such an idea after winning an election without being jettisoned immediately? They would be impeached or sacked for daring to use their personal religious faiths in such a manner. Actually, such an idea would not even cross the mind of the most megalomaniac of European or American leaders. If it would not pass muster there, why here? Is it because as Africans our “leaders” can take us for granted? Is it because in Africa we elect people to lord it over us not to serve? Is it because as Africans, gullibility, ignorance and superstition pave the way for leaders to indulge in any frivolity without challenge? Could Nana Addo-Danquah Akufo Addo have won the 2016 elections if he had made the cathedral the priority of priorities when he was campaigning for office? The sizeable non-Christian portions of the electorate would have rejected him. So, he waits and sneaks it in after the elections claiming it was in fulfilment of a pledge made to his God – as if God is a material materialistic being given to demanding material things from humans! And those Ghanaian Christians supporting him thinking he is bringing glory to their religion must think again! Their religion is coming across as profligate, ostentatious and insensitive – hardly the kind of things Christ himself would have countenanced. It is not for Nana Akufo-Addo to impose a Christocentric edifice on a secular state like ours. He should bear in mind that when it suited him, he exploited a non-Christian politician as his running mate, currently the vice president! The cathedral is not a nation-uniting edifice, it is an ego trip along the lines of Houphoeit-Boigny’s basilica, “Emperor” Bokassa’s Central African empire and similar wasteful pet projects of other African demagogues. That this is happening to Nkrumah’s Ghana, just celebrated its 62nd anniversary of independence is very humiliating. And by the way, Ghanaian Christians do not need Nana Akufo-Addo’s help. They already have their own cathedrals, churches, chapels, large and small, modern and historical, strewn all over the country providing everything that the so-called national cathedral is promising. Some of their auditoriums can boast of more seating capacity than the six or so thousand-seater capacity Nana Akufo-Addo’s cathedral has to offer. The so-called national cathedral is therefore a whimsical, capricious, wasteful duplication of effort. 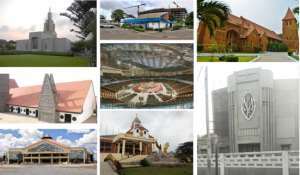 It is not unusual for people who can afford it – yes, who can afford it – to put up edifices to glorify their God – Christian, Muslim and others, but it is unchristian for any politician to (mis)appropriate public property, invade public space, employ state resources and exploit the authority of high public office for solicitation, to satisfy his whim, no matter how pious-sounding the whim may be. In simple English it would be called ABUSE OF OFFICE and cannot be supported anywhere in scripture! He could have used part of his salary and what he could raise privately and quietly, without the involvement of the State to put up a modest house of God somewhere in Kyebi and God would not have turned it down. All those tripping over themselves to support the building of a national cathedral in the manner in which it is being thrust upon us, may actually be abetting the abuse of office. This is a plea to the Ghanaian Christian community to be guided by the principles that underpin Christ’s message of humility, selflessness, kindness to the needy, law-abiding, lack of ostentation and hubris, doing unto others, etc... They must wise up to politicians’ excesses being perpetrated in the name of their religion. God’s glory/grace is not in buildings, it is in men’s hearts. It can never be Christian for the head of state of a secular, highly indebted and poor country to prioritize the building of a cathedral costing US$100 million and more over glaring existential bread and butter needs – a colossal amount of money that could be used to feed, clothe, educate and bring much needed succour to the poor of the land – a real thanksgiving, if there ever was one…. If it is a legacy project, why not give us another Terminal 3, another Jubilee House, another Accra International Conference Centre, another Ridge Hospital? Projects we can all buy into and utilise as part of our common wealth and national symbols without discrimination along religious or any other divisive lines. And finally, though the State must protect the freedom of worship, it must in no way lead to state capture by religious bodies and personalities. This author has authored 5 publications on Modern Ghana.